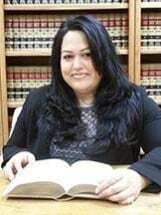 Angelina I. Romano earned her law degree at Trinity Law School in Orange County, California where she served as Editor-In-Chief of the Trinity Law Review from 2011-2012, and received several American Jurisprudence Awards. Ms. Romano also competed at the national level in both moot court and trial advocacy competitions. Ms. Romano earned a Bachelor of Arts degree from Azusa Pacific University where she was a Dean’s List Honoree. Prior to working at Rose, Klein & Marias LLP, Ms. Romano worked as a trial attorney in immigration. Ms. Romano also has a background in personal injury, social security, family law, criminal defense, bankruptcy, employment, and appellate law.